We had a cheese party last night at Ying and Ståle’s apartment. We all brought cheeses and/or dessert, and we ate cheese and bread and salad and grapes and smørrebrod and cream pies until we nearly exploded. As is our tradition. I only took pictors at the beginning, so I didn’t get the pretty smørrebrods or pies, or Ståle’s Norwegian brown cheeses. I can tell you about them, though. Smørrebrod (“smeh-reh-bred”) is a Danish open-face sandwich with a variety of toppings. We had roast beef and remoulade, smoked salmon and hard-boiled egg with dill and mayo, caviar with sour cream and chopped onion, and boiled egg with smoked salmon roe. Excellent. Ståle’s Norwegian mayo comes in a tube, like toothpaste, as does the smoked roe. The pies were my creation, both cold and creamy, since fruit fillings are out of the question (Ying has a mysterious aversion to the texture of any fruit). I filled one pie shell with thick rich chocolate pudding and a second shell with a sort of creamy sour-orange curd (really an approximation of sour orange made from one part orange, one part lemon, and one part grapefruit; recipe from the Lee Bros), and then topped both with sweetened whipped cream and either chocolate shavings or grapefruit zest. I love my chocolate pudding, but the sour-orange pie was amazingly good. Erik actually asked for seconds; the skies opened and angels sang. But let us not forget the cheese! 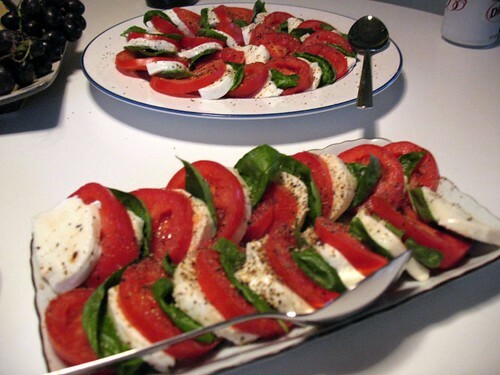 To accompany, we had crusty baguettes and a delicious Caprese salad Ying made. 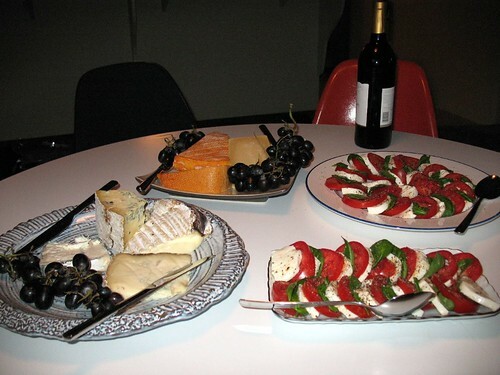 And we also had cheese, so much lovely lovely cheese. These are Margaret’s and Ying’s cheese contributions. 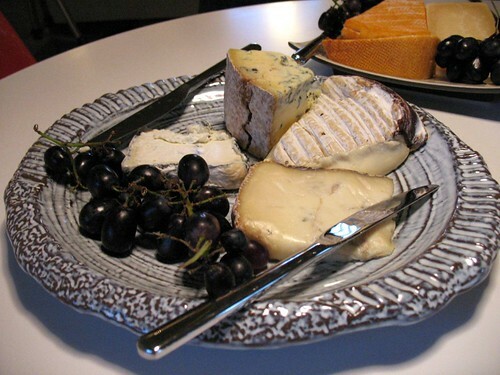 Clockwise from the lower-right (the cheese with the knife on it): Gorgonzola, Humboldt Fog (a Northern California goat cheese), English Stilton, and a very ripe Brie. Clockwise from bottom center: a French cow’s milk cheese called something like Le Marcail (couldn’t read the guy’s handwriting), a Northern Italian cow’s milk cheese called Piave (and the sole hard cheese of the evening), and a French sheep’s milk cheese called Etorki. I bought them at the Cheese Store of Beverly Hills. The cheeses were all excellent. My favorite was the Le Marcail or whatever it’s called. Ying and Margaret really liked the Etorki. It was a marvelous time all around, and the boys actually won Pictionary for once. 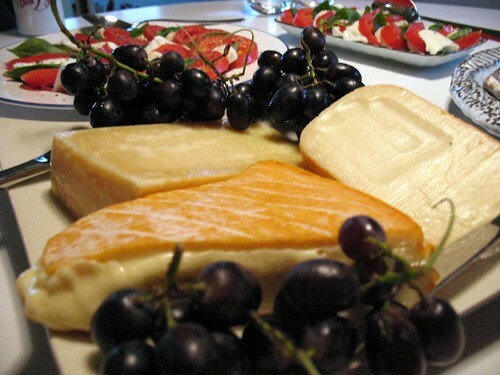 Sometime, we will have another cheese party. Now I’m going to walk down to the Chinese Theater and see if I can catch the actors arriving for the US Harry Potter and the Order of the Phoenix premiere! If I get any pictors, I’ll share them! We couldn’t be bothered to go to the OotP premiere early enough, or stay long enough, to catch any of the stars. We found a decent vantage point — too far for picture-taking, but close enough to see the arrivals — but it was just too crowded and boring, so we left. Hopefully tomorrow I can go early enough to see the actors when they stamp their hands into the cement in front of the theater, though! I won’t mind waiting around for hours if it’s in the morning, before the sun gets too strong. wow, those are some gorgeous cheeses. What fun. Next time, I’ll definitely try to come. And I’ll see if I can find some good Irish cheese…it’s yummy stuff!